Trainer Darryl Hansen celebrated the New Year winning a golden ticket in next week's Magic Millions Classic with Le Chef at the Gold Coast on Saturday. Ridden by leading apprentice Luke Tarrant, Le Chef led all the way to score a decisive one length win over Real Good in the First National QTIS Two-year-old Handicap (1200m). The first two home streeted their opposition with third placegetter Red Magic, a further 4-1/2 lengths way. It was the last roll of the dice for six runners in the race to qualify for the Magic Millions Classic next week. Le Chef showed brilliant speed out of the barriers to lead comfortably and had his opposition off the bit 800 metres from home. Tarrant's only worry was how Le Chef would cope with the rain-affected conditions. "I wasn't worried he went so quickly as I knew he would maintain it," Tarrant said. "My biggest worry was how he would handle the track and I wanted a good break in case he didn't handle the wet. "Darryl has a quality horse and I've got no doubt he can cut it with the others next week." Hansen admitted he was relieved Le Chef had qualified for the Magic Millions. "It was the final swing of the bat," Hansen said. "What I really liked is that Luke looked after him which is good. "I've got to look after him for another seven days now and I'll wrap him in cotton wool." Hansen isn't worried about backing-up Le Chef, who was a $120,000 buy at the Magic Millions sales last year. 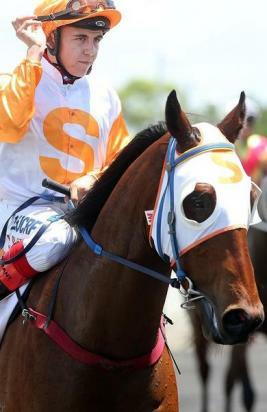 The son of Exceed and Excel finished fifth on debut at Doomben on November 29 before scoring an easy 4-1/2 length win at Ipswich on December 24. The youngster raced in blinkers for the first time at Ipswich and sat off the pace before exploding away for an impressive victory. "He's had a couple of quick runs before today but I deliberately left something in the tank for next week," Hansen said. "I knew if he made it to the Magic Millions he'd have to back-up in a week."